Here's a song you don't here much on the radio these days - not on the stations I listen to, anyway! In fact, I can't remember the last time I actually heard this duet by two of Wales' finest pop stars. The song was first recorded in 1958 by the R&B doo-wap group The Spaniels, but this cover is based on the 1960 duet by Dinah Washington and Brook Benton and features a very similar production style. Shaky and Bonnie's version reached #5 here in the UK during 1984 (No.1 in Ireland) and became the 94th best-selling single of the year. Two other songs by Shaky feature in the 1984 Top 100 and these are A Love Worth Waiting For (#28) and Teardrops (#85). A Rockin' Good Way was Shaky's 14th hit single (his previous hit was the No.3 hit Cry Just a Little Bit) and was later included on his studio album The Bop Won't Stop. This was the rock 'n' roll singer's first album to be released on CD, but it was less successful than his previous three top five albums, stalling at #21. A Rockin' Good Way was Bonnie Tyler's first major hit since Total Eclipse of the Heart had topped the charts in 1983. The B-side featured the song Why Do You Treat Me This Way? which was recorded live at the Birmingham Odeon on 15th Nov 1983. The track was penned by Stevens but didn't feature Bonnie Tyler on vocals. 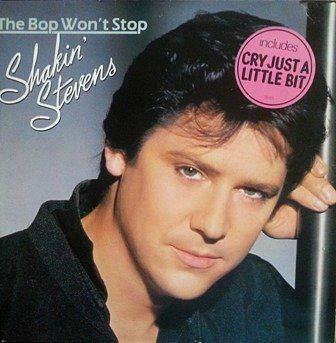 So far, Shakin' Stevens has released 66 singles and 19 studio albums.